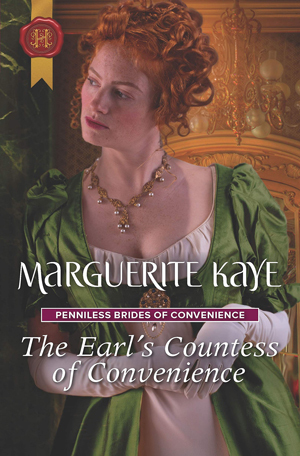 THE EARL’S COUNTESS OF CONVENIENCE, the first book in the PENNILESS BRIDES OF CONVENIENCE series, is written by one of my favorite authors of historical romance, and it only whet my appetite for more. While I was turning the pages far into the night, I savored every moment. This historical romance is set in England in 1827, and the author’s descriptions of the setting and London society transported me there. Eloise and her sisters are likable characters that have depth. They were orphans taken in by their uncle and his wife of convenience, Kate. Their uncle works and lives overseas while the girls live with Kate in England. They are also friends with her. When her uncle makes a suggestion to Alexander Sinclair, the future Lord Fearnoch, that he should make a marriage of convenience to Eloise, Alexander decides to meet her to see if they could be of like minds and make a match. When they first meet, there are sparks, though neither seems to pay attention to the attraction. As Eloise and Alexander get to know each other and marry so he can become Lord Fearnoch, we get to know them too. Both the hero and heroine are trying to discount their feelings since Alexander’s job takes him abroad and doesn’t allow him to focus on anything or anyone but work. As the story twists and turns, I loved how they exchange kindnesses. I also enjoyed how Eloise tries to expand Alexander’s world, giving him interests in things other than his duties. The author does a wonderful job of sharing the characters’ pasts, which fleshes out their motivations and thoughts. Eloise’s twin sisters, Phoebe and Estelle, along with Kate, are woven throughout and added another dimension and playfulness to the story. Eloise and Alexander share kisses and almost more, but that would have destroyed their marriage of convenience. There is wonderful closure and a better happily ever after than I hoped for that takes place two months later. The historical note at the back of the book gives additional information to the story. I look forward to the next three books in the series. I always look forward to reading what Ms. Kaye pens!